Allopurinol is a fast-acting prescription oral tablet, intended to prevent and dissolve urate bladder stones. Allopurinol is a xanthine oxidase inhibitor, which means it inhibits the production of uric acid, preventing the build up of the crystals in the urine that cause bladder and kidney stones. 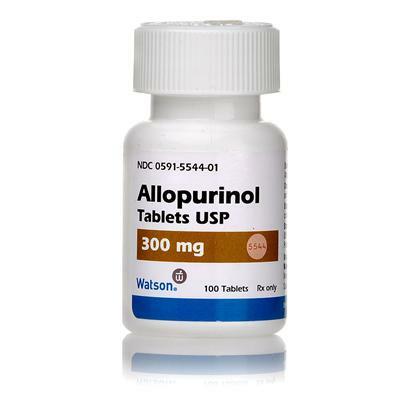 Allopurinol works by preventing the conversion of protein purines to uric acid. While Allopurinol prevents bladder and kidney stones, it can also dissolve stones that have already formed, and also treats infection due to the blood parasite Leishmania. Allopurinol is the generic alternative to Zyloprim. Read the full Allopurinol Medication Guide. Seek emergency veterinary aid if your pet experiences an allergic reaction such as, hives, difficulty breathing, swelling of the face, lips, tongue or throat, blood in the urine, pain when urinating, a rash, eye irritation, fever, chills or joint aches or severe nausea or vomiting. Consult veterinarian if your pet experiences upset stomach or diarrhea, dizziness or drowsiness or an acute attack of arthritis, or anything out of the ordinary. Ampicillin or amoxicillin may increase the risk of rash development. Notify your veterinarian if your pet is being given a thiazide diuretic, azathioprine, drugs used to treat cancer, cyclosporine, warfarin or theophylline. Consult to your veterinarian before administering additional prescription or over the counter medications. Administer Allopurinol to the exact specifications prescribed by veterinarian. Give Allopurinol orally with water and food.